Welcome to Knowledge/Culture/Ecologies (opens in a new window)(KCE2017) the 4th conference in the Knowledge/Culture series (opens in a new window), a sequence of international conferences created by the Institute for Culture and Society (ICS) at Western Sydney University, Australia. 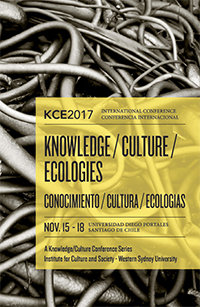 The KCE2017 conference is taking place in Santiago, Chile and is hosted by Universidad Diego Portales (opens in a new window)in partnership with Pontificia Universidad Católica (opens in a new window); the Center for Social Conflict and Cohesion Studies (COES) and Núcleo Milenio de Investigación en Energía y Sociedad (opens in a new window)(NUMIES). Bienvenidos a Conocimiento/Cultura/Ecologías (opens in a new window)(KCE2017) la 4ta conferencia en la serie Knowledge/Culture (opens in a new window), creada por el Institute for Culture and Society (ICS), de la Western Sydney University, en Australia. La conferencia KCE2017 tendrá lugar en Santiago de Chile organizada por la Universidad Diego Portales (opens in a new window)en colaboración con la Pontificia Universidad Católica (opens in a new window); el Núcleo Milenio de Investigación en Energía y Sociedad (opens in a new window)(NUMIES); y el Centro de Estudios de Conflicto y Cohesión Social (opens in a new window)(COES).